Just imagine this flyer says “July 22nd” instead. That rain postponed us just a bit. But we will do the same plan this Sunday. 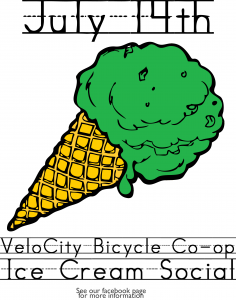 Join us on a very casual summertime ride around Alexandria to our local ice cream vendors. We will be leaving from VeloCity around 6pm and heading to Pop’s Old Fashioned Ice Cream, Coldstone Creamery, and finish up down the street from the co-op at Dairy Godmother. Cruiser bikes are suggested but totally not required.